Visited on a Sunday morning, travelled some way as their website marketing makes this look like a big market with a lot of varied stalls. In reality it is super tiny, you can walk round the market in less than 5 minutes - seriously - i couldn't believe it was so small, most stalls are selling things no-one actually needs, this market must for people who don't know what to do with their lives except shop for junk to clutter their homes. The food stalls claim to be vegan and gluten free but you can see they're really meat based stalls with one item on the menu just to try to pull in hipsters who follow fads rather than catering to the true vegans and gluten free market. There's an Italian food stall with a badly hastily written sign saying 'vegan', and a stall that sells goat curry that says 'vegan options'. No thanks. There's not much for the true vegan or coeliacs or those who can't eat gluten for health reasons since the street food stalls will have major cross contamination. Really all these stalls seem to be paying lip service to vegan and gluten free, you can tell they don't really believe in it. Greenwhich market website marketing might be flashy but it sets the wrong expectations, definitely didn't meet expectations. Disappointed in the experience, and I expect most people will be underwhelmed if they visit too, which is why I can't recommend this as a place to visit, hence the one star. If it was possible I'd have given it zero. Total waste of time and money travelling to visit here, would never come again. Small but lovely market with boutique shops and stalls selling unique crafts, fashion and local art items. The food stalls serve a great selection of cuisines with good quality dishes. The only downfall is there is not much space to sit and eat, which is a shame on days you can’t grab and sit in the sunshine by the Cutty Sark. For me, the market comes particularly alive at Christmas with decorations and lights spilling onto the surrounding streets. I love Greenwich market, it always makes me feel like I'm on holiday! Despite it's age, it's still going strong, the permanent shops around the perimeter of the market house independent retailers and and some lovely artisan products from local makers. On Saturday's the market hosts a variety of stalls including talented craftspeople selling their wares and some of the best food and drink there is to offer. Perfect place for a wander and a spot of lunch, just brace yourself for the crowds! I enjoyed Greenwich Market as part of a day out with my mum and our family friends. Though we didn’t buy anything, I still enjoyed mooching around the markets taking in the atmosphere and hope to return soon. The food and drink options were particularly enticing, although we had the promise of pie and mash to follow our market visit so managed to resist, though next time I’ll be sure to sample the grub on offer! The crafts stalls were interesting to see, although lent themselves best as souvenirs or gifts I thought – not really something I’d personally pick up for myself. No toilets at the markets but was told the pub on the corner (can’t remember the name) allowed use of their facilities, felt a bit rude but we went in nevertheless and they didn’t bat an eyelid. Greenwich market is a must do for anyone in the area at the weekend. It's has street food stalls which will tantalise your taste buds (even if you've already had a hearty breakfast) and plenty of arts and crafts stalls to browse. Be prepared to queue to get a bite to eat - you can always tell where's good to go by the stalls with the longest queue of people. Trust me, it's always worth the wait. Escape the crowds by taking your food to the naval school's grounds to enjoy. Perfect for a rainy day as it's all undercover. Greenwich market is such a lovely place to wander and perfect as part of a day out in Greenwich itself (if it's not your local). On a sunny day you can buy your lunch and go and have a make-shift picnic up on the hill, with fantastic views of London. Although I don't personally love the craft stands, I do think they are great if you're looking for a gift for someone and possibly sell more to tourists than Londoners of course as we're used to seeing this kind of stuff. But the food stands will leave you wishing you'd worn your elasticated trousers as there is so much choice. I also love the shops surrounding the market where there are some nice vintage shops and independent retailers. My recent discovery is Corkville who I will be making a bee-line for next time - a fantastic shoe shop. I love visiting Greenwich and one of the reasons why I love it so much is the market. 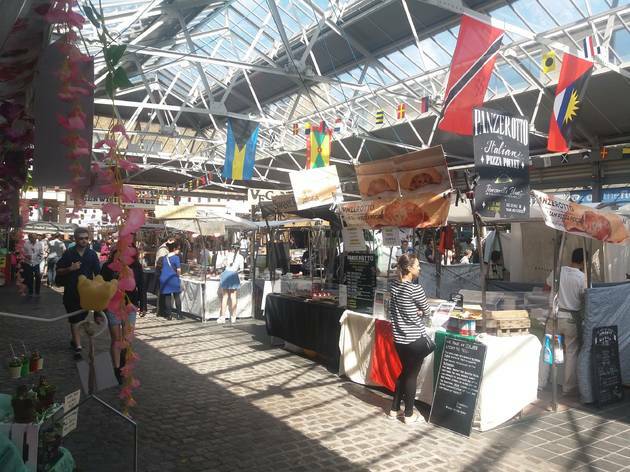 Only second away from Cutty Sark DLR station, and only a stone throw-away from the historic tea clipper, Cutty Sark and Royal Naval College, Greenwich market is a unique market offering vintage gifts to incredible range of food to try. As soon as you enter, you’re greeted by this enticing aromas of food from all corners of the world from Brazilian churros to Sri Lankan curry and towards the back you’ll find gift unique ideas. The food is a must-try and reasonably priced. If you have a penchant for all things vintage ad quirky as I do, you’ll love the vintage stalls in Greenwich Market too. You can find some pretty quirky and unique gifts you wouldn’t find anywhere else. Where else can you get a card-holder/wallet personalised for free? If there is to be a minor gripe, the market is quite small and can become overcrowded. I personally found it manageable and it didn’t bother me too much. This is coming from someone who absolutely hates being in a crowd! Greenwich Market is a must visit when you’re in the area. It’s quirky. It’s vintage. It’s historic. It’s one of many things that makes Greenwich so special. It’s small too so you can cover it quickly if you wish and it’s in close proximity to all the other attraction Maritime Greenwich has to offer. Don’t forget, Greenwich is a weekend market, so go on the weekends! 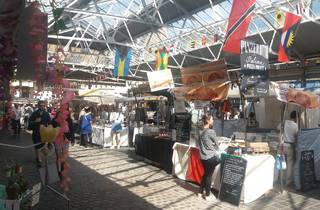 I spent this last Sunday browsing (and eating) my way around Greenwich market. It's very overcrowded and small, and the arts/crafts stores are rubbish but the food is fabulous. I especially like the scotch egg stand (definitely get chutney and mustard lathered on top) and the indian food stand does great lamb samosas. Also the juice stand is expensive - £2.50 for a small cup of juice, but it's gorgeous. Ok, enough. It's fantastic for food, not for much else. Oh, apart from a seriously good art gallery which has reasonable prices and some lovely prints.